On New Year’s Eve 31 December 1999, Mom suffered a stroke. It affected her ability to process things going on in the present. Much of her long term memory was still intact. She was near her 88th birthday. Dad missed her terribly. As I browsed through photos recently, I found one of her hand resting on the arm of a chair. It was taken in September 2000 when we visited her in the nursing home. She had arthritis. Swollen knuckles and wrinkles were obvious. If they could talk, they would have many stories to tell about life and the hard work it demanded. I gathered my pencils, charcoal, and paper. This entry was posted in Personal and tagged Drawing on April 5, 2018 by Jim R.
What a lovely drawing, and such touching memories. There’s something about a drawing that captures reality in a way a photo can’t: maybe it’s a result of the heart attached to the drawing hand. A drawing invites much more time and attention to its making. 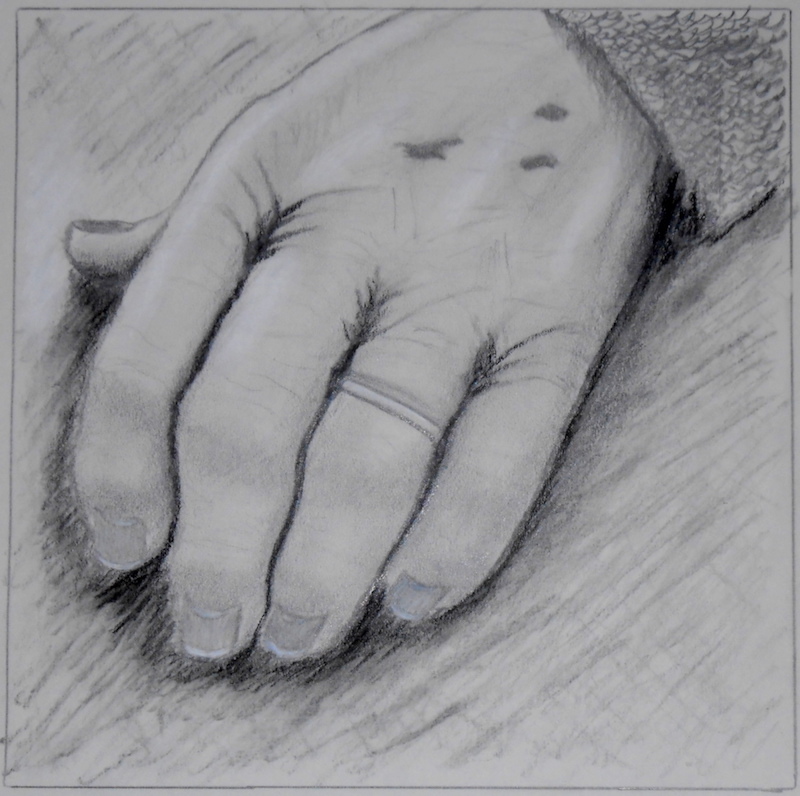 Nice rendering, Jim – hands aren’t easy to draw. I imagine the process must have been soothing. Soothing is a good term for it. I find it involves a lot of focus. Thank you Eliza.